Egypt was wracked by demonstrations on Tuesday’s “Day of Rage,” called for by the April 6 committee of youth activists on social media last week. The protesters were hoping to profit from the momentum for reform in the region created by the Tunisian revolution, which forced the Ben Ali regime from power nearly two weeks ago. CNN estimates that at the height, the rally was 15,000 to 20,000 strong in Liberation Square (Maydan al-Tahrir), downtown Cairo. The rallies protested the high unemployment rate, high price of food, and long years of ’emergency rule’ by President Hosni Mubarak, under regulations that suspend most civil and human rights on grounds of national security. The pan-Arab London daily, al-Hayat [Life], wrote: Thousands of youth in Egypt yesterday disappointed expectations that the call for a “Day of Rage” put out on the internet last week would fail. 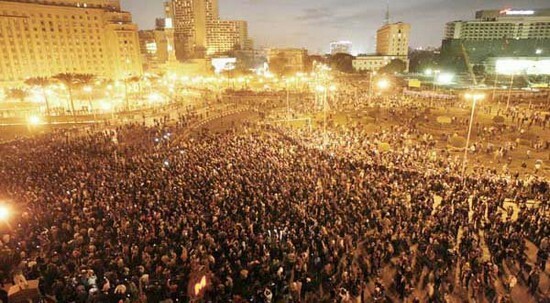 Numerous big demonstrations were mounted in the center of Cairo and a number of provinces. This, even though the streets were thick with security personnel. Their attempts to disperse the demonstrators failed, but two bystanders were killed by gunfire in a provincial city. When demonstrators in Cairo started throwing stones at the parliament building, Egyptian police intervened with tear gas. Egypt is of the utmost geopolitical importance. In one recent year, 7.5 % of all the world’s trade passed through the Suez Canal (and a much higher percentage of seaborne trade). Over 4% of world petroleum trade went through the canal. Egypt, with a population of 81 million, is the 15th largest in the world. A middle income country, it has the world’s 36th largest GDP in nominal terms, putting it ahead of Malaysia, Nigeria, Israel, and the Czech Republic. Egypt’s soft power in the Arab world, as its cultural center, and its peace treaty with Israel, make it a crucial ally of the United States. Unrest in Egypt puts a great many things in doubt that are important to the US. Were a government to come to power that was more hostile to Israel and more committed to the Palestinians, that development could roil the region. I lived in Cairo for altogether about three years, off and on, know Egyptian Arabic, and have written two monographs and lots of articles and book chapters about modern Egypt. I was there in January, 1977, the last time the country was shaken by demonstrations on this scale. Seeing these events reminded me of the late afternoon I came out of a public lecture at the American University in Cairo onto Liberation Square, to find throngs in the streets and the sky darkened with debris. People were throwing rocks, bottles, pieces of wood. Young men were carrying friends on their shoulders. They taunted then President Anwar El Sadat. The demonstrations were caused by Sadat’s decision to listen to the International Monetary Fund and to cut subsidies on bread, other staples, and natural gas canisters, making all of them shoot up in price and harming the working and middle classes. After three days of rallies and fruitless government attempts to impose order, Sadat announced he was restoring subsidies, and Egypt calmed back down. Because it was purely a food price protest, it suddenly evaporated when the government met its demands. The US embassy denied rumors that the president’s wife, Suzanne Mubarak, and his son Gamal and his daughter-in-law had fled the country on private jets. 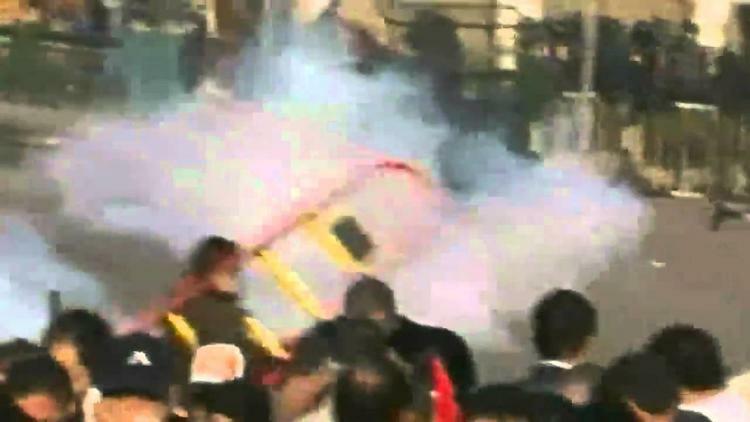 In the course of the demonstration and an attempted crackdown, one brave youth faced down a water canon all on his own. Protesters called for further rallies on Wednesday, but the Interior Ministry declared that such demonstrations would be banned. Authorities closed off Twitter access and slowed down the internet as a way of keeping protest leaders from communicating with one another. Dissidents were said, however, to be able to use instant messaging to get around government interference in communication. One question is whether these demonstrations are food riots as in 1977 or whether now they want more, i.e. political reform. (Political reformers certainly backed the protests, but these groups, such as al-Ghad (Tomorrow) and supporters of former IAEA head Muhammad Elbaradei, are small and previous calls by them for masses to come out have gone largely unheeded. The Muslim Brotherhood did not actively back the demonstrations, though it allowed individual members to participate. These crowds were mainly newbies without strong political affiliation). A second is whether the army and security forces will stand unified behind the Mubarak regime, as they have in the past. In Tunisia, the army refused to fire on demonstrators on behalf of Ben Ali. But Mubarak is a former Air Force general, who came out of the military to rule the country, as part of a military regime established in 1952. A caution: Egypt is not Tunisia.